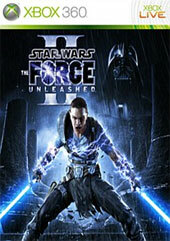 Star Wars: The Force Unleashed II, the single player action sequel to Lucas Arts mixed gem Star Wars: The Force Unleashed and is a step up for this spectacular story line. Bringing a moody darkness to the epic much like Empire Strikes Back did for the films. 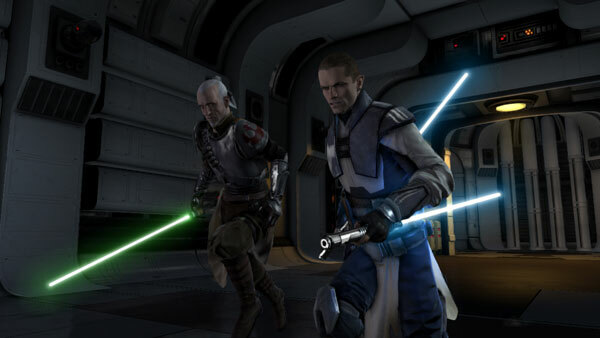 At this stage of the game, one can only hope for a third game because Starkiller is a character you just want to follow and see how his adventures go. The events parallel the events in Star Wars: Episode III and Episode IV. The original game sold more than seven million copies worldwide. With such intriguing twists in the storyline and intertwining the events with the Star Wars time line and iconic characters that fans know and love, just cements this latest game in the hearts of Star Wars fans worldwide. Our hero/anti hero Starkiller gave his life in the last game…so how in the world is he back in this latest continuation of the saga that is Star Wars? Well simply put, it seems you cannot keep a good clone down. Darth Vader for some reason has plans for Starkiller and the use of his clone, in order to crush the Rebellion Vader works behind the scenes trying to make the perfect clone of Starkiller. The story line is actually engaging, bringing back Darth Vader’s secret apprentice. Of course, nothing ever goes right, or at least not exactly as planned. Haunted by residual memories of his genetic template, the clone Starkiller soon finds him self at odds once again with the Empire the story line is straightforward, not very in-depth. However, an intense one full of emotion, it is a simple story with our hero having a single mind to find the love of his life, or at least the women that he remembers loving. The whole thing was engrossing enough to have me jumping with delight as the story unfolded. 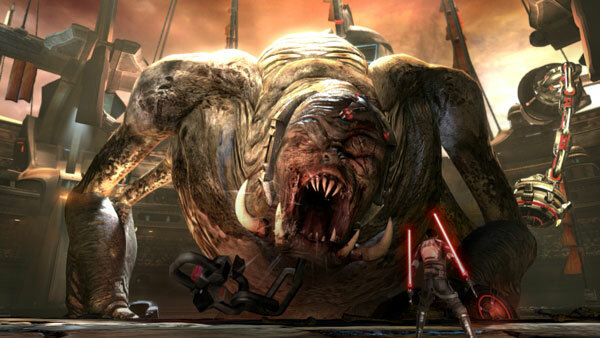 In truth, the story is like a sub plot to the larger story that is Star Wars: The Force Unleashed, both 1 and 2 together. While the story captures bits and pieces of what the original was all about; by itself, it just does not feel as complete. Taken together as one story it feels more solid. Still it does have its true Star Wars adventure moments that have you stare with mouth agape as the events unfolds. Play wise, I was not so sure of what to expect here. Sure some of the same old stuff to be sure. 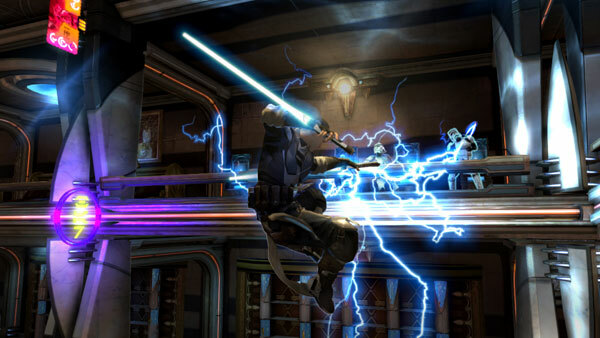 Happily Star Wars: The Force Unleashed II delivers even more over the top fun and the feel of being a rogue Jedi…a little of Sith and a little of Jedi rolled into one. With some of the force powers we all know and love from the last game, there are a few new cool tricks too. Jedi mind trick is one of my favourites. Storm Troopers can be tricked into fighting for you, or they can be over come with mind numbing fear and leap to their doom. Force Fury is kind of like hooking the Jedi abilities to a super battery. The Jedi powers increase exponentially. 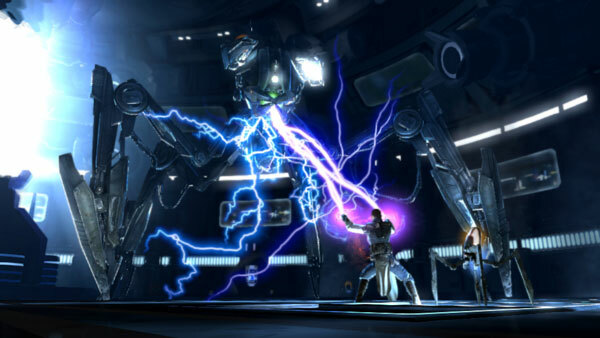 For instance, force lightning…rather than send a target twitching to the ground in convulsions, Fore Lightning enhanced with Force Fury now fries a target to a cinder. One other helpful power is more game oriented but nonetheless welcome, push a button on the D pad and the force can show you what direction you need to take. The controls have been somewhat streamlined, there are still combos that can be achieved by a multitude of different button presses…but the main attack button is just one button mash madness. This is not necessarily a bad thing. It makes the game that much more accessible to just about any level of game player. Powers like force grip seem much more tuned and less haphazard, the targeting seems much easier and control of an object is much more pin point accurate. Most of the areas that the adventure unfolds in are somewhat interesting, though you can only stand the inside of a large space ship for so long before it becomes a bit of a bore. The game breaks that up a bit with some mild challenges including puzzles to solve, find a power coupling to insert in a junction to get a door open…. (Kind of strange in some respects since up to that point I was force pushing and force gripping door open and turning them into scrap to get through.) There is also some plat form jumping to break things up a bit, sometimes un-hindered and sometimes dodging enemy fire. The visuals look great. However, occasionally when a lot is going on, or there are explosions the graphics can stutter a bit. The characters all look great and reactions are sometimes amusing as Storm Troopers react to the force powers. 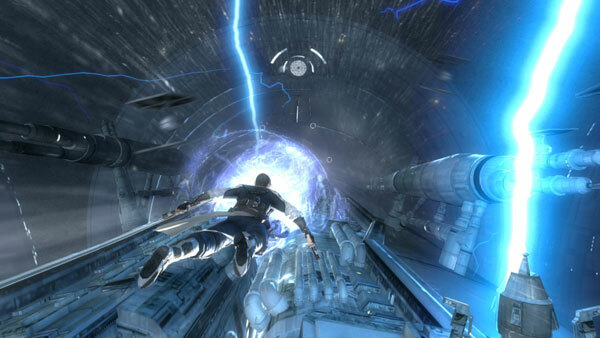 The game uses Pixelux Entertainment’s Digital Molecular Matter (DMM) joined with the Havok physics system and Euphoria from Natural Motion LTD. Even with the occasional graphical stutters, the tweaks to the computer-controlled characters show vast improvements all around in how they move and react. Speaking of character movements, I will not spoil too much for you if you have not played the game, but it is cool that Darth Vader moves and fights just like his movements in the films, after the armor and breathing aid. 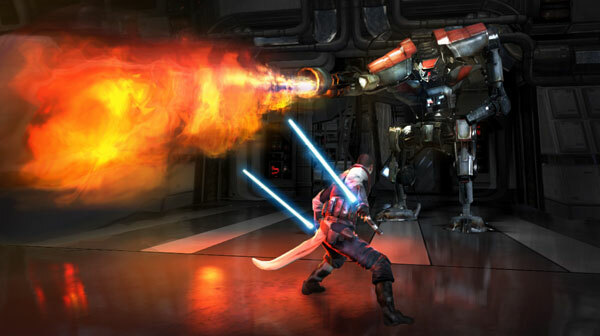 There are a couple of new enemy that really are tough to handle, especially if they have a bunch of Storm Troopers as back up, these are big droids that use either flame as a weapon, or carbonite to freeze you. If you have the bad luck to be frozen in mid leap…down you come and break into bits and that’s the end of you. These big droids come equipped with a massive shield to block in coming attacks. The tactic to take that away is learned early in the game. Force grip the shield and bash them with it. Then they are open for your attacks. They are not a push over by any sense of the word. They can be defeated though with the right tactics. 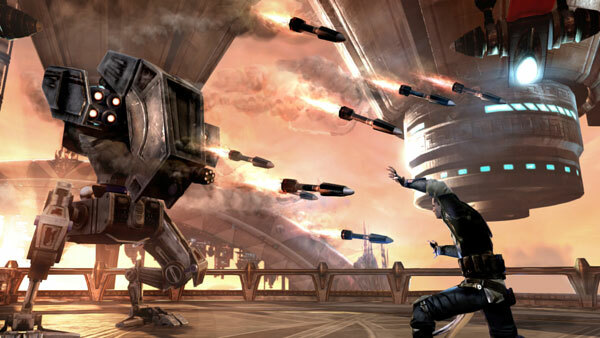 In the end Star Wars: The Force Unleashed II is a straightforward linear game. While it really does not bring anything new to the gaming experience…. It is a very good chapter into this franchise that will please many a fan and gamer alike. We can only hope for another chapter, maybe a bit longer than this game that was finished in an evening of play. 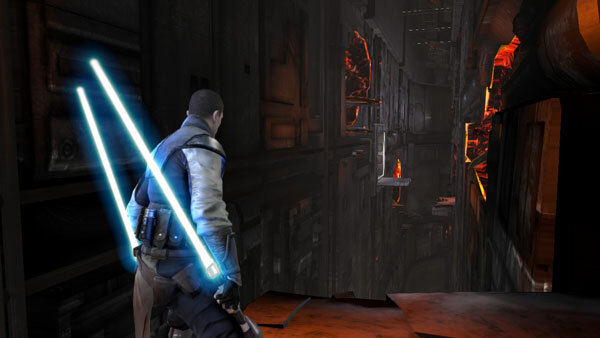 There has to be more to this adventure, to the story of Starkiller, as to if LucasArts see’s fit to do another one…well we can only wait and see.